Ashcraft Funeral Homes have been family owned and operated for four generations with locations in Penns Grove and Pennsville, New Jersey. Founded as James D. Torton Undertaker (1873-1916) and located on South Broad Street in Penns Grove, the firm was acquired by Hannah Ashcraft, who began working for Mr. Torton following the passing of her husband. In 1916 Hannah’s Son, Hollis F. Ashcraft, became a licensed funeral director and the name of the firm was changed to H.F. Ashcraft Funeral Home. Hollis’ son, John K. Ashcraft, assisted his father with the daily operations of the firm and the name was soon changed to Ashcraft Funeral Home. Following service in WWII, John K. obtained his funeral directors license and assumed responsibility of the business in 1947.
Business continued to grow and in 1954 a new funeral home was built at 47 State Street in Penns Grove, located in a residential neighborhood to maintain that family atmosphere; this funeral home is still utilized today by the people of Penns Grove and the surrounding communities. John K.’s son, John G. Ashcraft, helped with the daily operations until entering college. In 1983, John G. became a licensed funeral director and has assumed ownership of the business. He and his wife, Debbie and their sons, John Lee and Grant Joseph still reside in the home where he grew up. 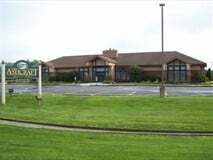 In 2001, a second location was opened at 740 S. Broadway in Pennsville and the name of the firm changed to Ashcraft Funeral Homes. Both sites border the Delaware River which is incorporated into the official logo of the funeral homes. John is the 4th generation of his family to own and operate the funeral home. He was licensed in New Jeresey in 1981 and brings the care and dedication that has been paramount to the service provided by his family for four generations to the families that he serves today. He resides in Penns Grove with his wife and two sons.